It's a nice change, and I like the new content on a lot of the pages (e.g. airport photos, etc.). - It seems very zoomed-in, with a lot of scrolling required. Slightly smaller images and text may make it more user-friendly (but I'm nitpicking here). - The homepage has all the NWP parameters (rain, wind, temperature, pressure), but these can't be accessed from the Forecasts page (as far as I can make out). You have to click back to the homepage to get them. I would say your front page has too much data on it. Great improvement overall and the Meteogram is a great idea. The fact that it is responsive rather a very basic mobile version is a huge improvement. I would question the Rain Radar image and the chosen colour legend though. Really like the new site. My only comments are on the forecast - on the current site I would normally go for a day of the week, and then jump between the wind, precipitation and temperature forecast. Each time you move to a new section then the time jumps back. - Any chance you could use larger fonts, they can't quite see it from the ISS... more seriously, your fonts are very large. I had to check chrome to see if I had set it to 110%. If it were me, I'd nudge them down a point or two. 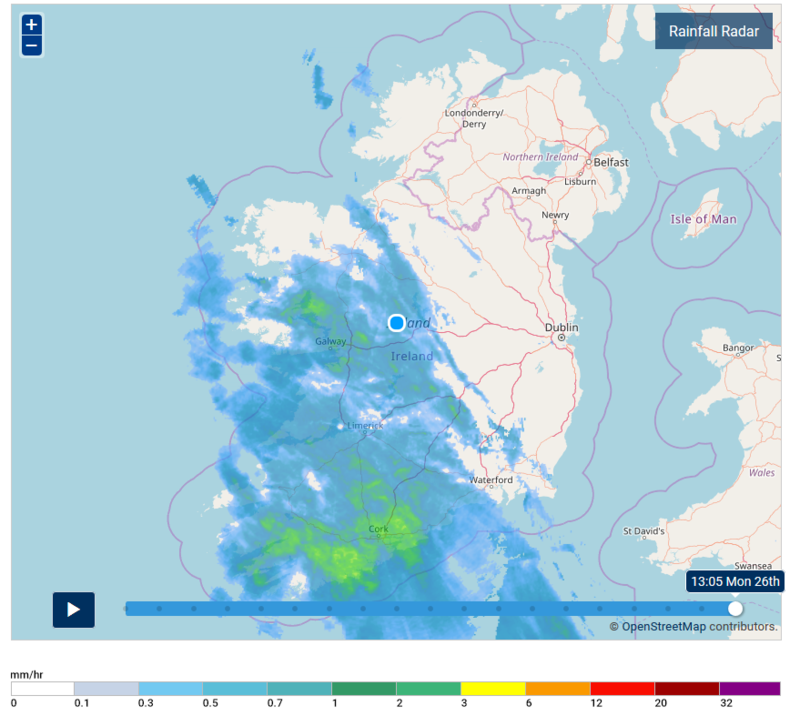 - Speed up the animation on the rainfall radar, its glacial. Forecast overview to include temperature. Possible to have more history on the radar? The current 6 hours is very handy for predicting showers. Ability to drag the slider and see image update would be great, or even a speed control for updates (as mentioned in earlier posts). Would also agree with earlier post RE colour coding of rainfall intensity - the clearer the differentiation the better. its great,I like the colour, maybe the font is a bit large. How about you take part in the the monthly Forecasting competition. Waves are missing from the forecasting. Satellite/forecasts/rainfall images are too big. I need to scroll on my screen to view the entire image, running on the default macbook pro resolution of 1440x900. It just fits on 1680x1050. -No preview when sliding through hours/days on the radar or forecast maps. -County outlines were very useful to help locate your area. New website is nice and a welcome improvement but I feel the radar colours need working on, especially the colour legend and the lack of contrast between land and sea. The plain white map of Ireland and the pale blue ocean doesn't really work that well imho, plus there's a little too much distracting information added by way of the road network. County borders might be more beneficial than the roads. or even the present hi-res display which would be so much better again. Still, all in all, a big improvement from what I've seen so far. I'm sure when it's all up & running it will be very good. Last edited by Comhra; 26-03-2018 at 15:31. Hard to change a weather website thats already fairly good. I used to try and change mine and kept going back to simple format. Lots of people of all ages use Met Eireann website. 2. Temperatures include the decimal points in latest reports. 4. Video forecast like Met Uk n BBC. 5. The main things i look for on Met are latest obsevations nationwide, yesterdays weather and text forecast so leave these as they are as they are satisfactory bar the decimal points. Its beta but could be better if kept simple. Last edited by Harry Palmr; 26-03-2018 at 16:23. 1). Love the fact that the radar is now updated every 5 minutes. Something like Netweather where the radar shows precip type would be welcome but still a great improvement. Also, having lightning in the radar is brilliant. 2). Good to see a 6 day outlook tailored to my location, however I am never a fan of painting one day with the same brush, perhaps showing a few icons rather than one to show what the weather will be like? For example, we could easily have heavy rain in the morning and then sunshine for the afternoon and evening, many days can have different types of weather all thrown into few hours. 3). Monthly values up to a certain point and being able to compare them to past years is great. No obivous improvement to be made here! 4) Having all current observations available on mobile and being able to download them are great! However if (as Gaoth Laidir mentioned) we could get temperatures to 1 decimal place and have the dewpoint too, that would be a great advantage. 5). Just spotted the short term and long term forecast charts available on the home page. Brilliant. Valuable resource for us weather enthusiasts! Last edited by JCX BXC; 26-03-2018 at 18:04.